An inquiry into the police custody death of a man is "fully independent", Bedfordshire's chief constable said. 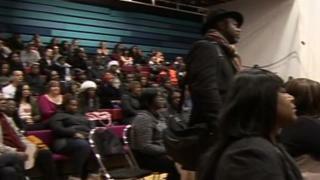 Up to 250 people attended a meeting in Luton on Monday following the death of Leon Briggs, on 4 November. Chief Constable Colette Paul said the Independent Police Complaints Commission (IPCC) was immediately called. Mr Briggs died in hospital after he was detained in Luton under mental health legislation. The meeting, at the Carnival Arts Centre, was told five police officers and two members of civilian staff had been suspended from duty. Ms Paul stressed the investigation was "serious" and it was important to get to the truth of what happened to Mr Briggs. She said: "The Independent Police Complaints Commission (IPCC) investigation was truly independent and we will be co-operating with it fully. Image caption Leon Briggs was described as "bubbly... with an infectious smile"
"We called in the IPCC at a very early stage because we, along with everyone else, are keen to find out why Mr Briggs died." A witness said Mr Briggs was screaming during his arrest and complained to officers his handcuffs were too tight. His friend Cyril Mitchell said he had never been in trouble before and described him as a "bubbly character with an infectious smile". Mr Mitchell said: "He was just a lovely guy. In the 15 years I'd known him he never had any interaction with the police, been angry or had an argument with anybody. "He's now leaving a seven-year-old girl behind and that's criminal." Police said the move to suspend the seven members of staff "in no way jumps to any conclusion about the outcome of the investigation", but would ensure "neutrality and transparency" during the investigation. Mr Briggs was detained following concerns from members of the public about his behaviour. The IPCC said it believed "that potential criminal offences may have been committed". "We continue to co-operate with the investigation to help provide Mr Briggs' family, the coroner and the IPCC with accurate information about how and why Mr Briggs died," the force said on Monday.